The disappearance of Colony Record's old sign back in 2004 was one of those episodes that sewed the seeds of the project that became New York Neon. The Colony survived and even installed some new neon, but the loss of its old sign made me realize that the time had come to start photographing the city's veteran neon before it was too late. And now, as reported last month, the Colony's replacement sign too is set to vanish. The old sign whose loss I so ruefully bemoaned 8 years ago was not very old at all, as it turns out. Though it looked like something out of the Robert Wagner era, it seems to have actually appeared in the early '70s, when the Colony moved into the famous Brill Building from its original location at 52nd and Broadway. The sign was memorable for its poodle skirt-clad neon maiden, leaping joyfully into the air, disk in hand, exclaiming I FOUND IT! The Colony's old sign, seen in an old photo formerly shown in its display window. 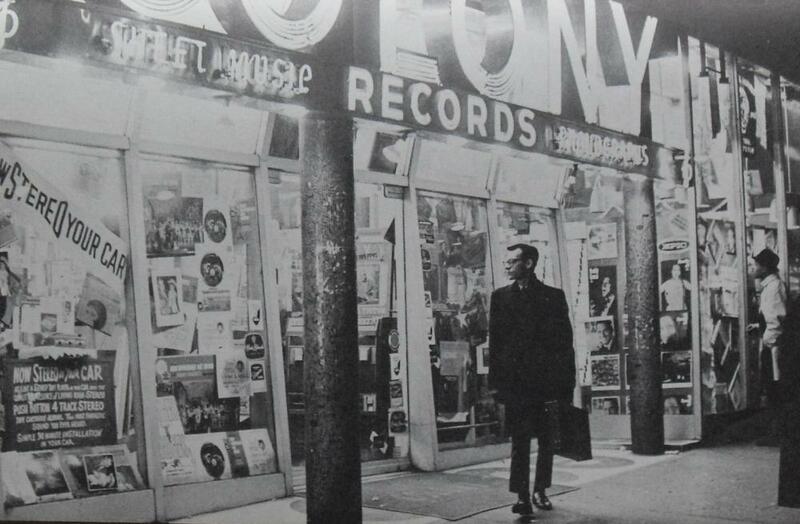 The disk girl was the successor not just to the Colony's original sign, but also to a series of extraordinary neon storefront displays that have anchored the northwest corner of 49th and Broadway for more than 80 years. 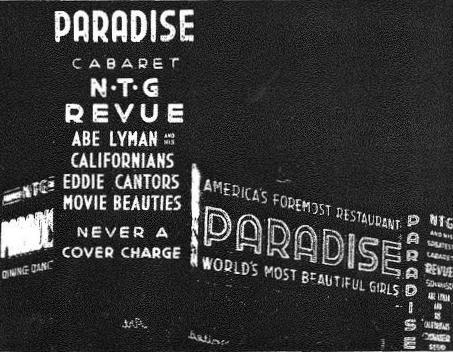 The Brill Building opened in 1931, and by 1933 the corner now occupied by the Colony stood dressed in 2,500 feet of red and blue neon heralding impresario Nils T. Granlund's "Paradise Cabaret," a second floor nightclub that featured the "World's Most Beautiful Girls." 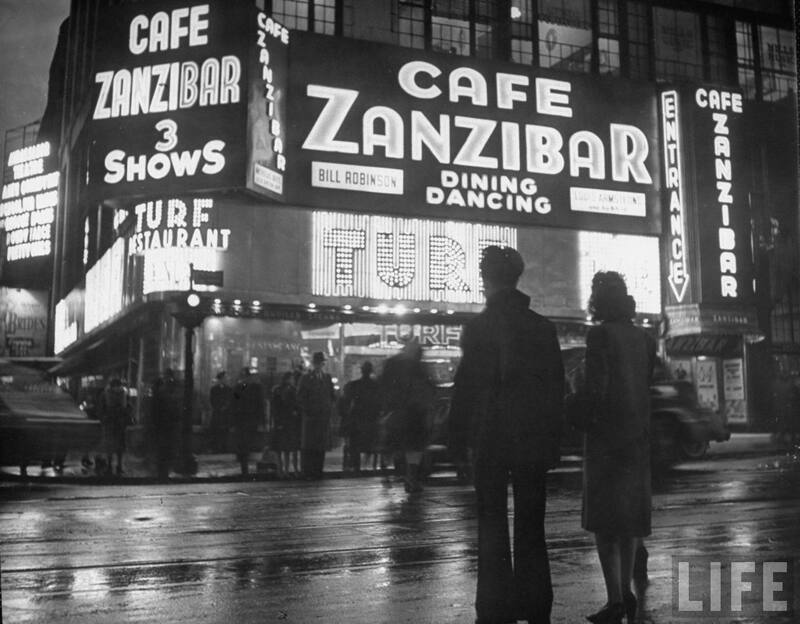 The Paradise didn't last long: by 1940 it had re-opened as a nightclub called the Hurricane, which itself made way for the exotic sounding Cafe Zanzibar by 1944. 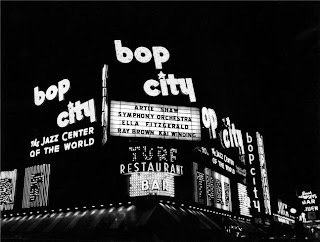 But the Zanzibar too proved not long for this corner: in 1949 it yielded to Bop City, a jazz club that lasted only a few years, despite featuring some notable headliners. The ground floor meanwhile housed Jack Amiel and Arnold Ruben's Turf Restaurant, which opened in 1940 and outlived one nightclub after the next until it finally closed in 1963. The upstairs space eventually became home to a joint called the Avalon Ballroom (of which I could find no photos), but this too closed by 1966. The northern part of the Brill Building meanwhile initially housed a Translux movie theater, which made way in 1937 for Jack Dempsey's "Broadway Bar and Cocktail Lounge." Jack Dempsey's lasted clear up through 1974, about the time the Colony showed up. The Colony's sign swap, c. 2004, see in photo formerly displayed in its display windows. Today, the Colony's modest animated sign is the sole heir to a succession of legendary New York neon. 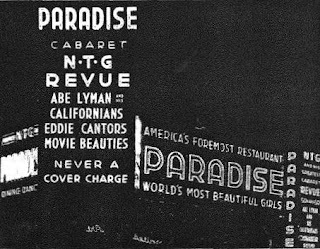 (An April 2011 post on the blog Lost City yielded some details on the old sign's disappearance - a zoning code issue, reportedly.) What will follow it is anyone's guess. A rather sinister rendering of the storefront's possible future appeared last week on the Jeremiah's Vanishing New York blog (which also shared a New York Post report that the Brill Building's new owner helped usher along the Colony's demise by imposing a five-fold rent hike). Whatever comes here next will have some big neon shoes to fill. • First word of Colony's Closing, at JVNY. • JVNY's report on the mega rent hike. • NYT piece on the end of the Colony. • Lost City blog's post on the Colony's 2004 sign swap. • Highly informative LPC designation report for the Brill Building. • I have seen the neon book, and it is good! She'll be in stores in about a month's time . . .
Can't wait to get my copy! Where can I buy it? How old is neon? I mean, how long ago did people start using neon for signs and advertisements? 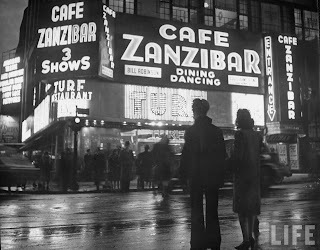 I absolutely love looking at old neon work, it is so much fun. And where better to look for it than New York? I love these Building Signs images.Thanks for sharing.Keep it up! !